Everyone I know seems to be sick. The flu hit late in Arizona this year with coworkers dropping like flies, and friends seemingly unable to stifle the sniffles, I have basically been bathing in hand sanitizer. My poor already winter dry hands are riddled with cracks from over washing. And still, the bubonic plaque seemed to have worked its way into my system. Yay for germs! Thankfully only the tiniest lingering symptoms remain. A little sluggish, the occasional congested snoring and a general feeling of unhealthiness. In the hopes of finally kicking this thing to the curb and starting the year off on a healthy note - I've decided to take a break from all sugars, dairy products & gluten - until this germ thing figures itself out. Basically 90% Paleo, which I've done a lot of research on lately, without the fruit for now. First plan of attack? Make a big 'ol pot of soup! - First, heat1-2 tbl. olive oil in a medium size pot. Mince the onion, add to the pot. - Once the onions are golden brown, add one minced carrot and chopped garlic.Sautee, adding a little salt & pepper, and a dash of the herbs. - Add the broth and water to the pot, bring to a boil. While waiting, rinse & chop the potatoes and remaning carrots. - Add the potatoes, boiling for a few minutes before reducing heat to a simmer. Drain and add can of beans. - Cook on med low for 45 minutes, tasting & adding S/P, herbs as you go. - Chop the broccoli, and the chicken sausage, adding to the pot as well. Continue cooking for another 15 minutes...and voila! 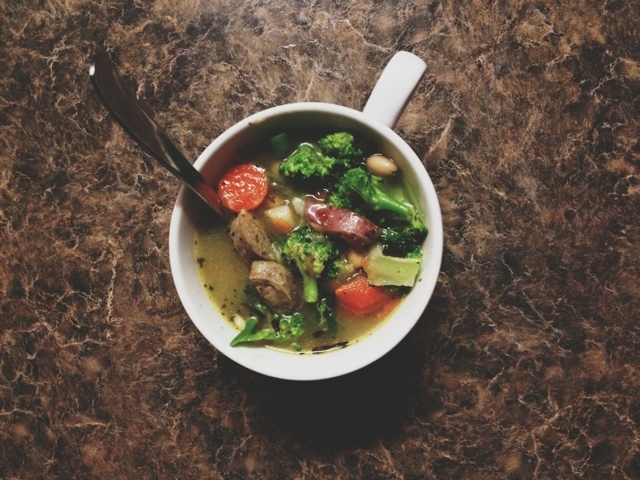 Delicious cure all sicknesses soup. This would be perfect to make this weekend! It's gonna be coooooold here!